I will say that I am not a fan of Tim Cook. Everyone in the tech world seems to think that he is this nice guy that has Apple’s best interests in mind. However, with Apple making changes to their products, not nnovating, but more so in making their products even more expensive without adding enough value to them, and as a result, their sales are going down. I am glad that someone other than me is starting to call Tim Cook out on his crap that is his version of Apple. The video where he is being called out is by YouTube content creator Mark Dice, who has a very well-established following on YouTube with over one million subscribers. Dice is known to post more political content, with him favoring a more Republican/conservative side. In Dice’s video from Wednesday morning, he calls out Tim Cook for being completely compliant of the blatant censorship. This all, of course, happened when Tim Cook received the Courage Against Hate Award Monday night. The irony of this is that Tim Cook did the exact opposite this fall when he, along with many other tech companies in Silicon Valley, censored and basically took down InfoWars commentator Alex Jones. 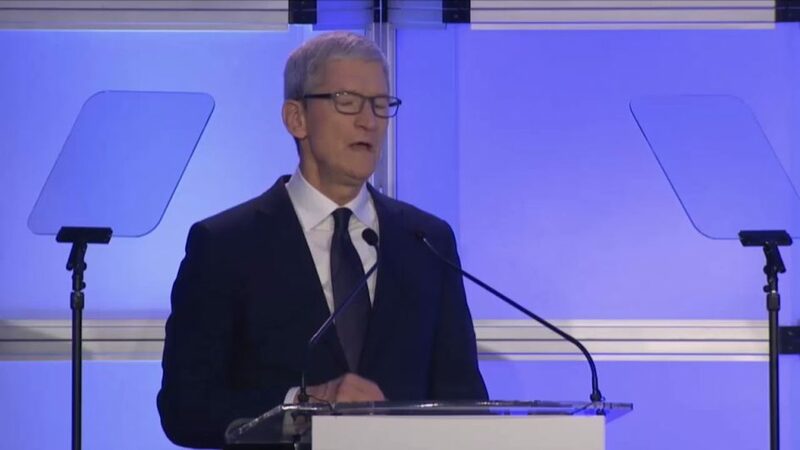 When Cook gave his speech while accepting his award, he went on to say that essentially says that tech companies should be encouraged to censor more people when it comes to “hate,” hate speech and white supremacy. Cook said in part of his speech, “For those who seek to push hate, division and violence, you have no place on our platforms.” Of course, this was met with applause from the crowd. In response to this in his video, Dice makes the comment, “But rap music about killing cops, dealing drugs and committing a variety of other crimes is perfectly fine.” The sad part is that Dice is not wrong. Dice goes on to say that Silicon Valley values and American values are completely different, which in a way, show off a disconnect between the two areas. To be honest, I do not think that Tim Cook is for Apple. Instead, I think he uses Apple and their events to push himself up the ladder and use the company as a platform for his own personal politics. This would make sense since around 2014-2015, Apple has not been as innovative as they were with Steve Jobs. I know that you cannot compare Cook to Jobs because Jobs had a one-of-a-kind mind. However, I can discredit Cook for his lack of vision with the company, which has come with a little bit of innovation here and there (AirPods and the Apple Watch), but the majority of Apple products being “me too” products and services such as Apple Music, the HomePod, and a plethora of borderline unforgivable software bugs on multiple devices and operating systems. Cook made another statement at the event saying, “ (We’re) Doing what’s right. Creating experiences free from violence or hate…” That right there is why Tim Cook should not be CEO of this company because that is not realistic. You’re going to have people that are mean or say things that are frowned upon, but you cannot stop them or shut them down with censorship. That will only make the problem worse. It’s like when you are a little kid and are told not to curse. What does that make you want to do? Obviously curse. If Tim Cook wants to improve his reputation or do what is truly best for Apple, it would be to step down from the company and let someone who is smarter, has a vision for the company and does not get highly involved with politics.